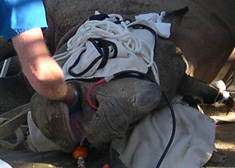 View of palpation exam of Rhino’s right mandible. 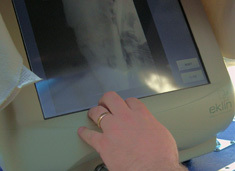 of healed fracture site to be printed for Clinical Record. 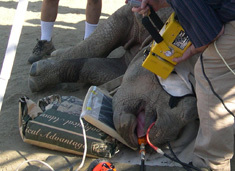 View of Portable X-ray head projecting image of Rhino’s right mandible onto special Digital X-ray Plate attached by computer cable to CPU for projection onto computer’s monitor. 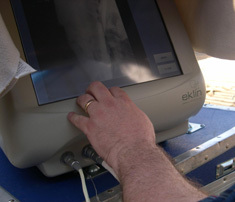 View of Portable X-ray Machine sitting next to Portable computer CPU/Monitor. 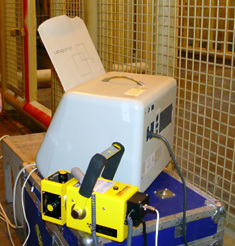 View of digital X-ray monitor shaded to protect from direct sun light. 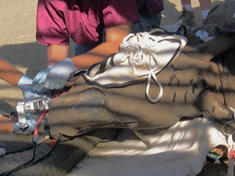 Closer view of image on computer screen. 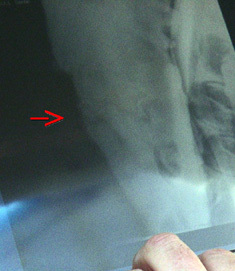 mandibular fracture site on computer screen.